The Denali by Shunyata Research is one of those products that came late to the UK. Everywhere else in the world (starting from the US on out) got the power distributor before us, but it was worth the wait; in making the Denali compatible with UK domestic mains power regulations, we ended up getting a slightly beefier version of the Denali that will now (no pun intended) filter through to other Denali customers. Not so much a Mark 2 Denali, more a Denali Version 1.1, and in fairness those changes shouldn’t amount to a sonic difference (so no need for owners of existing Denalis to start thinking of a trade-up) but we still get to reap the benefits. There is also a significant back-story to the Denali, underpinning all of Shunyata’s recent products. 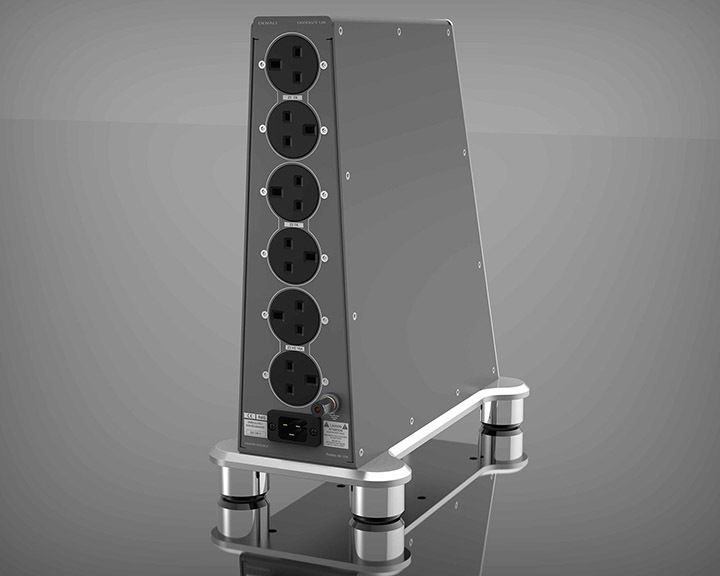 A few years ago, one of Shunyata Research’s clients was so impressed by what his Hydra Triton/Typhon power distribution box did to his audio system, he wondered if it could help in his day job. So, he brought the Shunyata product to work... and plugged it into the medical imaging device he used in his cardiology surgery. The resultant drop in noise floor he experienced at home also happened at the operating table; he could use the imaging products with greater definition, and – as a direct result – more operations had a successful outcome (given this is a cardiologist searching for vital electrical impulses in the heart itself, the opposite to ‘a successful outcome’ is pretty bleak). When this story filtered back (pun intended) to Shunyata’s boss Caelin Gabriel, he created a division of the company – Clear Image Scientific®– to help improve the resolution of medical imaging devices through cleaner power. That Shunyata’s products have a direct effect on medical imaging products is no surprise given Caelin Gabriel’s previous career in ultra-sensitive data acquisition systems. He’s used to pulling a signal out of a sea of noise, but that’s as near as it gets to discussing what Gabriel did in that past life because it’s all redacted Area 51 stuff. However, the innovations from CIS pass to subsequent generations of Shunyata Research products, and vice versa. The Denali line is a direct recipient of this bilateral research and development pathway. Central to Shunyata’s concepts, the Denali features CCI (Component to Component Interference), introduced many years ago with the introduction of the Hydra Model-8. The Denali was the first Shunyata Research product to use the CCI ‘Medical Grade’ filters that were developed specifically for the CIS power conditioner. These filters are designed to reduce noise by more than 40dB at 1MHz, which is also a marked improvement over the 24dB reduction provided by the aforementioned Hydra, Shunyata’s previous flagship design. The Denali uses two patented technologies in its design, the first being the NIC (Noise Isolation Chamber), which was introduced in the original Triton. The second technology is the QR/BB, which was developed under the medical research program. The Denali actually eclipsed the performance of the reference Triton for a time, but Shunyata created a third version of the flagship that included a similar hybrid technology from the Denali series, but in a larger and more effective form. As the acronym suggests, the CCI filters not only reduce mains noise, but also isolate the audio components from one another. As we inexorably move from an analogue world (with digital sources) to a more mixed audio palette with a greater number of digital sources, often involving some kind of Wi-Fi system, this need to separate the influences of one product on its fellow rack-mates is becoming a primary concern. The Denali helps to not only keep mains-borne noise from outside the system stay outside the system, it helps prevent inter-component contamination. As the other work-around option is multiple boxes to work on each component, the integrated, but separated, approach works for me. Alongside the CCI filters, the Denali also sports a patented ‘QR/BB’ dynamic enhancement. Typically, a power conditioner stores some power in capacitors, chokes, or coils. This is available to the devices that use the conditioner, but big ‘pulls’ on power delivery from the wall are not completely instantaneous as a result. This is why many power conditioners got short shrift with users of big power amplifiers, or – paradoxically – smaller power amps with stiff power supplies that give a taut, fast rhythm. In the first case, a power conditioner can seem to dynamically compress the sound, in the latter it acts to slow it down. Not here, though. QR/BB removes all those chokes and caps from the path, and in the process (according to Shunyata, at least) makes the current delivery more dynamic than the raw AC mains itself!